The Federal Government is moving to ratify an optional protocol to the United Nations Convention Against Torture and is also considering bringing in legislation to formally outlaw it in Australia. Attorney-General Robert McClelland has said that the Government also considers the controversial practice of waterboarding as a method of torture. [People also consider complicity in US war crimes, torture, rendition and war crimes in the Middle East and Indefinite solitary confinement and draconian laws here in Australia as controversial practices. The Government is consulting with the states about signing up to the optional protocol, which means UN inspectors could visit Australian detention facilities. Mr McClelland says the move signifies that the Government is re-engaging with the international community. "I think the United Nations will appreciate it's more than a gesture," he said. "It's significant. It helps to facilitate and give credibility to the international human rights framework. "It's quite hypocritical for a modern and advanced nation to call upon neighbouring countries to lift their standards in a number of human rights areas if we aren't prepared to set our own example." While Mr McClelland admits there are already laws against assault and detention which protect Australians against torture, he says there are still benefits to enacting a specific domestic law. McClelland: "The international body that monitors the convention thinks it is desirable where countries can specifically state and declare a specific offence of torture and that's what we're also exploring and canvassing the views of the states about," he said. Mr McClelland says the practice of waterboarding is "unquestionably" torture but would not specify if Australia's latest move was aimed at putting pressure on the US to outlaw it. "We would like to think that the greater number of countries that sign up to these international human rights standards and adhere to them sets an example for all other countries without specifically identifying any country," he said. Waterboarding, where water is repeatedly poured over a person's face, has been used by the US as an interrogation method. 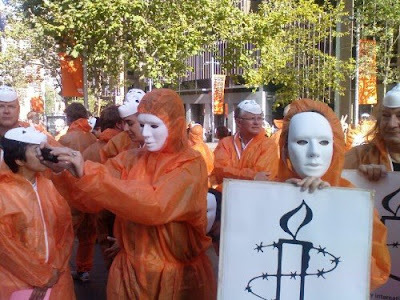 Australia is already a party to the UN Convention Against Torture which requires signatories to take steps to prevent torture inside their borders. But the Howard government had refused to ratify the optional protocol to the Convention which sets up a system for international inspections of member countries' prisons and detention centres. Quote: McClelland made the US and waterboaring his prime argument but why not look further in his own backyard? Because that appears to let him and his government, in some part, as well as the late Howard government, off the hook? Accept for the compliant and complicit war crimes, torture of prisoners in the Middle East, Guantanamo Bay, Abu Grahib and turning a blind eye to rendition etc. There are issues here in Australia like indefinite solitary confinement in prisons and draconian laws amongst other things....Like not sending war criminals like ex prime minister John Howard and his cronies like ex Federal Attorney General Phillip Ruddock to the Hague War Criminal Court. Civil rights advocates have seized on Federal Government plans for new legal bans on torture to argue for tighter controls on the use of Taser stun guns by police. The Federal Attorney-General says if Australia ratifies an optional protocol on the UN Convention Against Torture it would not stop Australian police from using Tasers. USA: Taser-related deaths pass 150 mark. Amnesty International Australia. The president of the Australian Council for Civil Liberties Terry O'Gorman called on the Federal Government to make good its stance against torture by pushing the states to introduce stricter rules on the use of Tasers by police. Tasers are electronic stun guns used to paralyse their targets. They are used by police in New South Wales, Queensland and Western Australia. Mr O'Gorman said Tasers were extremely painful and could cause death and were being used too readily by police. "The United Nations have said that it is a form of torture so the Federal Government has got to grab this whole issue with both hands and address the widespread, growing use of tasers in at least three of the eight state and territory police services in this country," he said. Robert McClelland says he is consulting with the state and territory governments about whether it should be ratified, and expects to release his opinion in the next few months. Mr McClelland says it would depend on how the Tasers were used. "Clearly if a Taser is used as an alternative to shooting someone dead then that is one thing, if on the other hand a Taser was used to repeatedly fire into someone for purpose of eliciting information then obviously that's a different situation," he said. But the UN's Committee Against Torture has said that they can cause acute pain amounting to a form of torture. Quote: What if Tazers were used against prisoners, detainees, demonstrators, protestors, dissent, public nuisances, pests, drunks, intolerance, unpopular people, homeless and the mentally ill, instead of just using dialogue or keeping them quiet by other means? Then the argument that the only use of a Tazer as an alternative to shooting a person dead is not true like McClelland says and that wouldn't sway the 150 dead in the US or those who would subsequently be killed in Australia. So there is a definite need to introduce stricter rules on the use of Tasers by police or prison guards if they're intent on using them at all. Tasers are a Lethal Meme. “Officers at Long Bay Prison Complex are on total strike at the removal of their positions in the Long Bay Prison Hospital. This means that Justice Minister Hatzistergos has the whole Long Bay prison community in crisis due to his callous attempt to cut costs and remove 28 prison officer positions on April 2” said Justice Action spokesperson Brett Collins. The loss of those positions led to the permanent 18 hour solitary confinement of mental patients. The whole mental health profession nationally, other authorities, teachers and patients have called for its reversal, ” said Justice Action spokesperson Michael Poynder. The strike began last Tuesday, and is likely to continue over the weekend. “The effect on the patients has been horrific. Service providers have expressed horror at this latest escalation. Normally such vulnerable people would be exempt from industrial action. This total isolation in single cells for mentally ill people amounts to torture and will cause immense damage,” said Mr Collins. “This out of control crisis means that Premier Iemma can no longer abandon responsibility to his minister. He gave assurances to Parliament as Health Minister in 2004 that oblige him to intervene. We call for him to accept judicial control of the area as is adopted by the US in such a situation, and to grant an immediate visit to the patients from their families and community support” said Mr Collins.